May 15, 2014, New York, NY — The comedic lifestyle web series “Velveteen Lounge Kitsch-en” has released a celebration of all things Liberace in honor of the flamboyant musician’s birthday on May 16th. 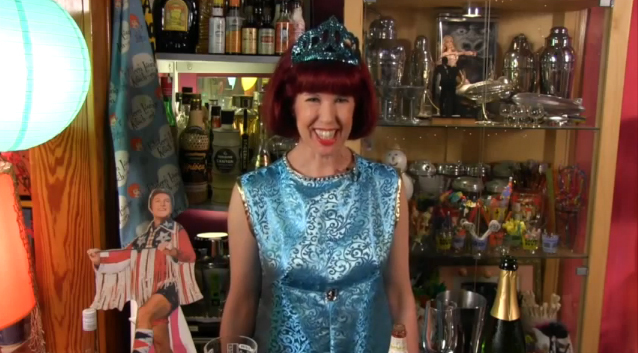 In addition to reveling in his legacy, series creator and star Kelly Camille Patterson guides viewers through an original libation she has concocted called “Liberace’s Afternoon Delight” as well as a decadent recipe for Cocktail Franks in Champagne Sauce. An entertaining lifestyle show with its tongue planted firmly in its cheek, the “Velveteen Lounge Kitsch-en” celebrates all that is fun and kitschy about food, drink and party planning. Series creator Kelly Camille Patterson is especially excited to dedicate this episode to Liberace because she has always been a huge fan of his. She even visited his Museum several times in Las Vegas, crying when she heard it was closing. She also brings in the holidays with not one, but two Liberace Christmas trees. The famous pianist mononymously known as Liberace was born Władziu Valentino Liberace on May 16, 1919. Internationally renowned for both his talent and his opulent lifestyle, Liberace was the highest-paid entertainer in the world from the 1950s to the 1970s, with a historic residency in Las Vegas. His work was recognized with two Emmy Awards, six gold albums and two stars on the Walk of Fame, and his tempestuous love affair with Scott Thorson was the subject of the critically acclaimed 2013 HBO film “Behind the Candelabra,” starring Michael Douglas. Kelly Camille Patterson is the hostess of the “Velveteen Lounge Kitsch-en,” the web series that celebrates all that is fun and kitschy about food, drink and party planning. The “Velveteen Lounge Kitsch-en” has been featured as a “Top Video” on TVGuide.com, on the humorous news aggregator Fark.com, and appears on several TV stations throughout the country. As an actor Kelly has appeared on “One Life To Live,” in a national tour of “The Wizard of Oz” and in many plays in New York. She is a regular columnist for Bachelor Pad Magazine and her writing has also appeared in Rocker Magazine and Ohana Magazine. When Co-Creator Paul Spencer isn’t toiling in the corporate world he can be found making videos, building things and playing records from his vast collection, a portion of which he uses in performance as one half of Dr. Benstock, an improvisational turntable duo that creates new sounds and rhythms from dusty old grooves. You can watch video tutorials from “The Velveteen Loung Kitsch-en” and listen to the show’s iTunes podcasts at http://www.velveteenloungekitsch-en.com.